Please scroll below to read our Sales Policy & Pricing Chart. In 2018 we sold over 30% of our herd—-and we are now at the point of ***trying*** to select goats from those meant to be our keepers. It is a blessing I don't take lightly---so, placing these animals in the right homes is of the utmost importance. Many have requested to be placed on a list (other than babies). Its been a very slow process, but we are earnestly trying to fulfill these reservations for adult does as well as dry yearlings, all of which are NOT culls. In the late Spring (after clipping), we may have a few yearling does for sale. Occasionally there may be a buckling (available after weaning) whose reservation fell through---so, please check our Sales or Kidding pages often, as the animals now being offered are from of our best stock and will go quickly. (Most of whom, we have retained the litter-mates) Other than an occasional mention on FB, I don't "advertise" because I want our goats to go to selected homes who will give them the best of care, providing quality homes to ensure their best potential. Once listed, you'll find the high points of each pedigree with a link embedded in the sire/dam for you to click on to get to their page for more info. After a LOT of consideration and prayer, we have decided to offer Hyssop for sale. We have a barn full of his sons and daughters out of three of our very best does, along w the 2nd freshening Oliver daughters who were designated SG/Elite, 1200-1400# Top 10 milkers. After setting up the 2019 Fall kidding schedule (most of the older does will be bred either to Oliver or his son, Exodus), it’s a shame to see such a nice buck, with a superb pedigree, just hanging out in the pasture. Hyssop’s litter sister (Serendipity) is one of our most favorite does, in every area. She’s sweet, beautiful, has a lovely udder, and LA’d/Classified in both registries w 90 or above. Sera’s Rear Udder Height was LA’d w a 35, and her Rear Udder Arch was 37. Both Sera and Hyssop scored E’s for Shoulder Assembly, She & her daughter are Top 10, 1000#+ milkers. Ideally, I’d love to see him go to a performance home as his pedigree, confirmation, and progeny all support his excellence as a buck. If you’re interested, please contact me—-he’s being sold Private Treaty—-since, we are still kidding (lack of sleep) and starting to breed for this fall, please—-serious inquiries only. He’s pretty shaggy right now—-so when we clip later this month, I’ll have updated pix as the shots below were taken when he was an older yearling. Thanks for your consideration. ﻿We tend to have an ongoing reservation list for yearling does, and usually have a few bucklings for sale in Spring & Fall. As you're aware, we are VERY picky about which bucks stay intact (having wethers out of some of our LA90+ does). We felt led to keep many of our bucks until their daughters excelled in DHI or LA/Classification or both---with the majority having (or will have) their +*S, +*B status. Its taken a while (years), but by sticking to those goals, we have worked very hard to improve upon each of our foundation lines. This all may sound easy, but goodness---I can make a case to keep every single goat in our barn. Clearly not realistic. Also please note---we have either retained sons, daughters, or sisters from these bucks who out of our best does---hopefully ensuring ongoing success to each buck up for sale. Feel free to email your reservations. I’m not the best at returning calls right now, nor am I checking FB daily. So, emailing to SinaiThunder@gmail.com will be the only way I’ll accept reservations. Thank you for your patience while I try to respond. I’m also going to request (please) that you don’t ask me to “pick out a goat” that I may think is perfect for your herd. I truly am spending all my time, energy, resources to try to figure out our herd. YOU know the style that appeals to you and what your goals are for YOUR herd. But, please be assured, I will genuinely try to point you to that “Type” or “goal” you’re interested in. First---one of my greatest joys is matching up the right goat(s) with the right owner. But please know, as much as I am committed to selling you the animal that fits your needs and don't foresee any issues, I do maintain the right to retain any goat, at any time. And, I thank you for your understanding. I DO plan each breeding with the intention of using them for my future breeding stock. I like things simple, so I do not require a deposit from a breeding. Just contact me (via email, so we both have a record) to reserve the kid(s) of a particular breeding you're interested in (before birth). I'll keep track of reservations according to the date we are contacted. I will notify you when I get your reservation, as well as when the kid(s) are weaned. Unless arrangements have previously been made, you have 48 hrs to make your decision. If I don't hear from you, then I'll contact the next name on the list. Once I get your commitment (via email), I require a $100 deposit within 5 days. If we don't receive payment, you place me in the position of contacting the next person on the list. To make it easier for you: we do accept PayPal. l will also take cash, money order, or a check. Please note: if you are paying by check, it MUST be cleared 10 business days AHEAD of departure. In the event something happens between time of birth and pickup, I'll gladly refund your deposit or apply it toward a baby that would also fit your needs, whichever you prefer. Because we dam raise, there will be at least an 12-14 week wait on bucklings (unless special circumstances arise). For doe kids, it may be at least 6 months (or longer), before your doeling is available for pick-up. You will need to have that junior paid in-full--before you pick it up. Please note, there will be no exceptions. Although I would not expect to ever do so, I reserve the right to refuse any sale without explanation and at that time. Of course, the deposit would be immediately refunded. Any and all costs associated with shipping or transportation, including any health certificates/related testing, crates, etc., are the responsibility of the buyer. Show Stock will be free of disqualifying faults at the time of pick up. However, once they leave our farm, there are no other guarantees to the future health, height, or quality of the animal. On occasion we have requests to breed a doe that we have for sale. Please know we are very happy to do so---but she must be paid for in advance. We take great pride in our breeding program and are very blessed at the results we've seen. However because we Dam Raise, I end up very attached to the babies and found it increasingly difficult to determine who to sell, as well as a fair amount to charge. After viewing the sales policy at Buttin'Heads Farm, I felt it was a superb format in which to price the ones we do decide to sell. (Many thanks goes to Tom Rucker). Our Pricing Chart (below) was adjusted to fit our program. 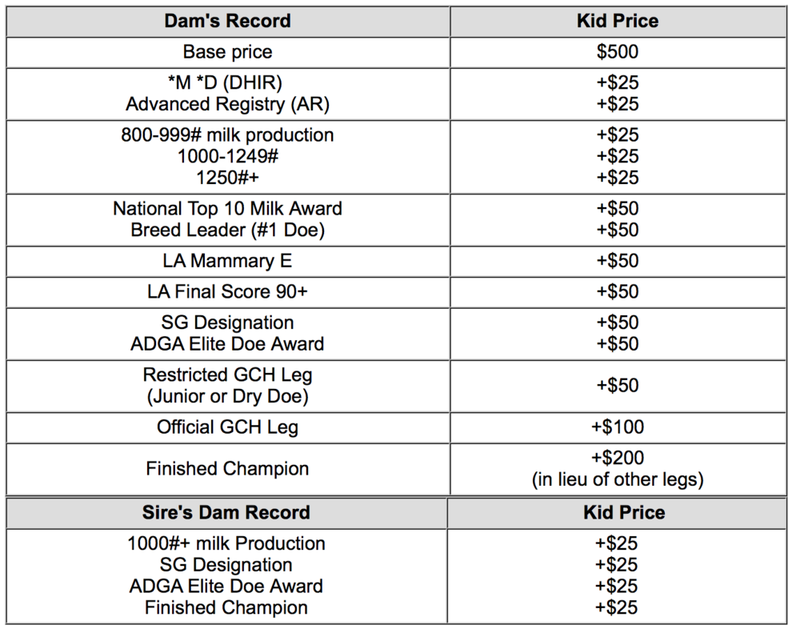 As you can see, the price of kids are based on the accomplishments of the dam in 3 areas: Linear Appraisal, Milk programs (DHIR &/or 1Day), plus Show successes. Does with exceptional records may have kids priced higher than the chart. In addition, bc we are blessed to have fabulous bucks with some of the nicest pedigrees & achievements in the industry, the kid price will also include the accomplishments of their sire's dam. Please note: I feel this industry only needs the highest caliber of herd sires; thus, we are very selective on which buck kids will be sold intact. So, the few offered will be priced the same price as the doelings. And, because genetics are out of our control, not every combination turns out the way we plan. (i.e. the combination of two fabulous animals can sometimes still result in a pet-quality animal) If this happens, the price for such an animal will be adjusted accordingly. ****a kid out of a *M/*DAR doe ($500 + $50), that milked 900# (+$25) with an E for Mammary on LA (+$50), and won her Jr GCH (+$50) would be priced at $675. ****a kid whose paternal Dam has earned her SG, Elite, & milked over 1000# will be an additional $75. In the case of Oliver (all 4 categories), $100 added to the kid's price. A final thought: Our emphasis is to raise (and offer) high quality goats. To ensure correct conformation, we annually participate in Linear Appraisal (ADGA) and/or Classification (AGS). To provide the best of Dairy genetics, we keep our girls on a year round Milk Testing program, called DHIR, where we test monthly for 305 days, and/or also do 1Day tests as well. In doing so, we have found that the mamas do best when they are kept with their babies and not be separated at birth, having the babies placed on bottles. Because we are now honing in on a few specific lines---my goal is to maximize the potential of each doe, including her daughter(s). That said, and based on some serious misjudgments on my part in the past, I plan to keep at least one (or more) of the daughters from First Fresheners. The reason is simple. We have found: 1) The doe will milk (and test) better with her babies nursing. 2) The production numbers of a doe (esp a FF) seem to stay higher and remain more consistent. 3) As the babies mature, I can better select the doeling(s) that best fit our breeding program. Not to mention, we get to study the strengths & weaknesses of the sire, as the kids pass through the various stages. It is to your best interest (not to mention the integrity of our breeding program), that the First Freshener has a great first lactation as possible. So, its entirely possible, unless the mama weans her own kids, many of our doelings will not be available for a large portion of their dam's 305 Test. We are very proud that several of our does (and now their daughters) have earned Superior Genetics designation, as well as become ADGA ELITE status. Each year, there are those who want to criticize the SG program, stating that many of the animals awarded aren't as high quality as their show stock. I beg to differ, but will not do so in an open forum. I choose to "prove" our girls otherwise---by raising goats who score high in LA and DHIR. Because we take our Milk Testing serious, we consider our does on Test to be "high performance" animals, feeding and housing them in a quality manner. We pour over the Linear Appraisal charts, and pray (a lot) for Wisdom & direction. Not only on breedings, but also on who to sell...and to whom. We are careful on who purchases progeny from our dairy lines. It brings us a lot of comfort when we sell to farms that participate in Milk Testing---as well as LA. We also will no longer sell a doe who has raised her own babies to a farm who opts raise/sell bottle babies. This paragraph is not intended to start a debate of dam raising vs bottle-fed. There are merits to both philosophies. I just cannot, in good conscience, know that one of my experienced mamas will have her babies taken from her in future kiddings. Not when she already knows what its like to be a good mama. In the past, we've agreed to breed sold does. That policy has been changed (unless our schedules permit---which w this many goats, I don't see that being likely). Previously, we've chosen to not charge breeding fees, or board for goats that are sold. While its my heart to always try to be a blessing to each of our buyers---but bc of our numbers, those policies are no longer practical. So, until further notice (aka our numbers get to a more manageable level), and in the event I even agree, we will start charging $100 to breed a sold doe (plus $50 for each subsequent 21 day cycle), and $3 a day (board) from two weeks after sale of any animal. Again, I apologize and hate that this sounds so mean-hearted---but last Spring, we ran ourselves ragged trying to watch does for heat cycles, and/or care for young stock until the buyer can make arrangements. Yes, I realize it takes time to arrange transportation, hence the 2 weeks. However, the reason why we are selling any of our goats---is bc we need the room and/or we don't have the energy/time to feed, care, clean, trim feet, etc your new goats. Most especially if you're going on a cruise, to the beach, or on a much needed vacation, wedding, reunion, etc. If you have any questions, please contact me....God's BLESSINGS be yours. Thanks so much for your inquiry! We will contact you as soon as possible. God bless, Jill.